What is the ‘Need to add a Distributor? Click Here’ link on my title’s Sales & Pricing detail page, and when do I need to use it? You should only click on this link when you are contracted to a book distribution company who is managing your titles’ marketing and sales. If you are marketing your title via your website or approaching retailers you do not need to add your own publisher name. The contact details you have provided in your MyIdentifiers account are sufficient. A ‘book distributor’ is often confused with a ‘book retailer’ or ‘wholesaler’. 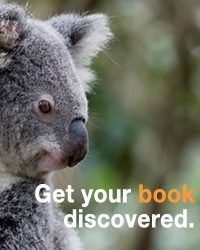 For instance, Amazon and Booktopia are wholesalers or online book retailers and, as such, are not designated as ‘distributors’ on the Books In Print database. Many wholesalers may offer some or all of a publisher’s products for sale at any given time, but generally do not act for the publisher. We do receive inventory information from the largest wholesalers and display this availability information in the Books in Print database. When using the ‘distributor’ link on MyIdentifiers, an email will be created to contact us here at the Australian ISBN office. Your email should contain one of your ISBNs as reference and the name of your distributor. Once received, we will verify that the distributor appears on Books In Print, and the distributor link will be added to your Publisher record. To add the distributor link to your specific title/s, sign in to your MyIdentifiers account, go to My Account > Manage ISBNs. 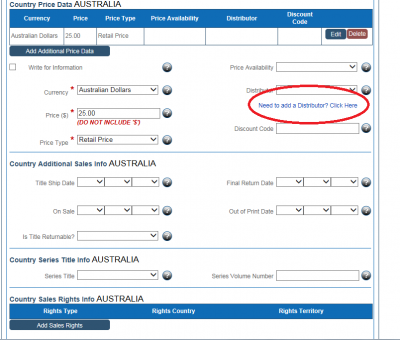 Click on the title or ISBN to open the record, then at its ‘Sales & Pricing’ page scroll down to ‘Country Price Data’ and choose the required distributor from the pull-down menu. Click SAVE.